Add some drama to your rough landings! Collision FX adds sound effects and sparks with lighting effects when you collide or scrape your craft. 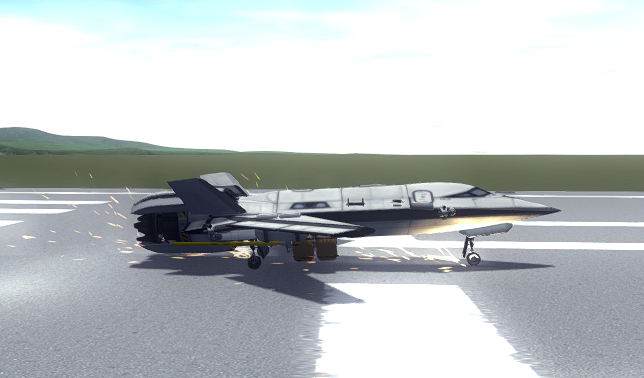 Landing gear also has a rubbery screech on contacting the ground. can you fix this bug where the audio keeps on going even though the craft stops doing it? Any plans for KSP 1.3? Thank you so much! This is one of my favorite mods, From the satisfying tyre screech to the Beautiful sparks, It's Essential if you ask me. PLS UPDATE THIS MOD TO KSP 1.0.5!! i dont know but thats weird sparks on wheels ... i think they should be smoke FX but i dont blame you why are there sparks on the wheels?? I've got an infinite load error on the Module Manager. Removing it obviously causes the mod to simply not work. Help? I can't play without this mod anylonger. It is just too dang good. Makes you wonder why this isn't stock? It worked at first for a while, but then it stopped working I tried reinstalling it, but it still does not work.